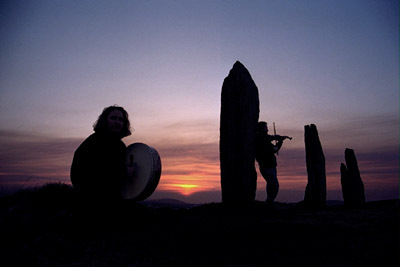 Barry and Beth Hall perform Celtic, Renaissance and Medieval music as the group "Nine Stones". The duo bring their musical energy and passion to a mix of traditional music that ranges from lively Irish and Scottish fiddle tunes to haunting Medieval ballads. 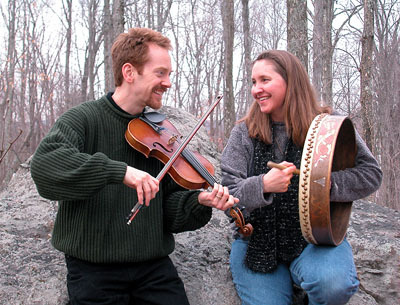 Barry and Beth sing and perform on a variety of musical instruments including fiddles, guitar, mandolin, bouzouki, flutes, bagpipes, didgeridoo and many drums and percussion instruments. The Halls’ music has taken them all over the world, performing as soloists and in ensembles throughout North America and Europe - from the Celtic Nations Heritage festival in Louisiana to the legendary Club Passim in Cambridge; from Notre Dame Cathedral in Paris to a to a miners' hall in rural Poland. Their music has been featured on National Public Radio's "All Things Considered" and on PBS and BBC television. Their holiday CD "A Feast of Songs" was featured by NPR's classical music critic as a top pick in 2010. Copyright ©1995-2012 Barry Hall, Hallistic Music. All rights reserved. Unauthorized duplication of page content, source, images, sound or video files is a violation of applicable laws.